is the first book to present all aspects of feline medicine in a form that is specifically relevant to Nurses and Technicians. This book explores the role of the Nurse and Technician and offers a practical, ‘hands-on' approach to feline veterinary care. 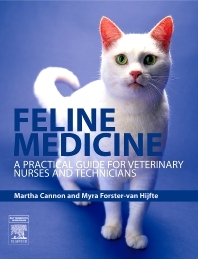 This is the first comprehensive guide to feline medicine aimed at the veterinary nurse and technician. Explains in detail the physiological and behavioral differences between dogs and cats — and how these differences impact veterinary care. Provides complete coverage of caring for cats — from basic handling techniques to advanced nursing skills. Includes tips from the experts on how to get a finicky cat to eat and how to pacify aggressive cats quickly and easily. Specialist in Feline Medicine; Director, Oxfordshire Cat Clinic Ltd.